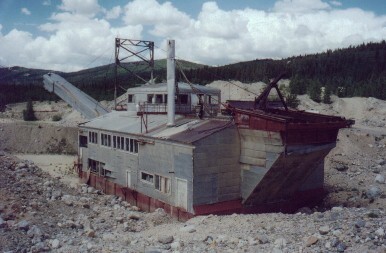 The Snowstorm Dredge was part of the largest and last dragline dredge in Colorado, and possibly the last in the nation. Used from 1941 to the 1960s, it completed the work of several hundred men as it dug and processed ore in the gold fields between Fairplay and Alma. A new operator of the sand and gravel operation where the Snowstorm is located appreciates the historical value of the Dredge and is willing to work with Park County and those interested in preservation of this important reminder of Colorado’s mining past. Previously collected funds will be used to stabilize the structure and ensure that future visitors can safely tour the Dredge. The dredge remains on private property. The South Park National Heritage Area has considered incorporating this into a larger mining heritage tour, but it would require property owner consent. Conversations on its future and use continue.